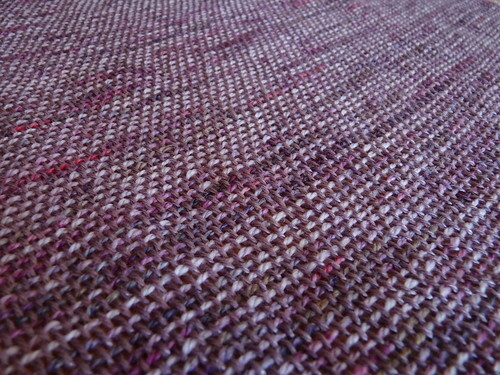 warp: Tactile Fiber Arts superwash merino/tencel, "orchid"
weft: Hand Jive Knits' Nature's Palette, "odd duck 5"
This wrap has been done longer than it took to weave... I want to do something different (read: not overhand knots) to finish the edges but can't decide, so it's just been sitting around waiting to be fulled for almost a week. Really pretty though-- I think once done the tencel blend from Tactile will shine-shine and the Nature's Palette will puff up even more. I've been almostthere with the "Sunny Side Up" merino/silk from A Verb for Keeping Warm for what seems like ages-- usually I don't want such a fun color to be over, but I was hoping to have something finished to wear to Keep the Fleece/Sheep to Scarf this weekend. 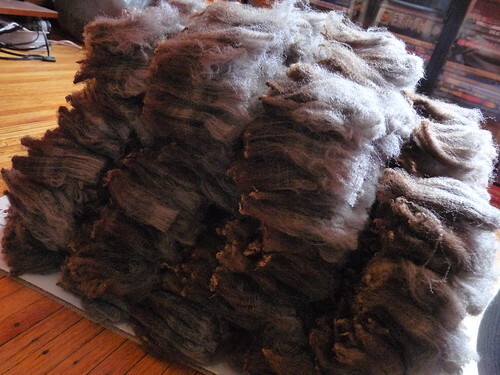 Admittedly all my fault (again), I got sidetracked playing Jenga with fleece. 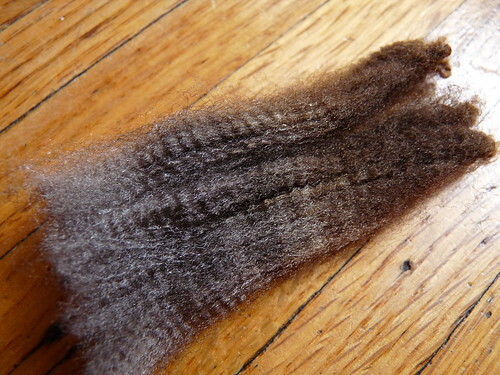 Very little makes me as happy fiberwise as arranging locks for washing when the fleece is as greasy and willing as this one. From Whitefish Bay Farm, "Velveeta." 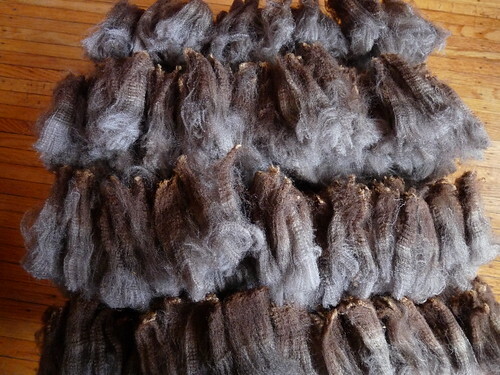 Buying a fleece from Whitefish Bay Farm is a crazy ordering experience-- they publish their list of available fleeces (no photos) and a time they will start taking orders, and its off to the races. I was hitting redial on the phone for an hour and half trying to order (just!) one, and didn't get my first, second, or even third choice. Crazy thing is, I am always super pleased with what I do end up with. 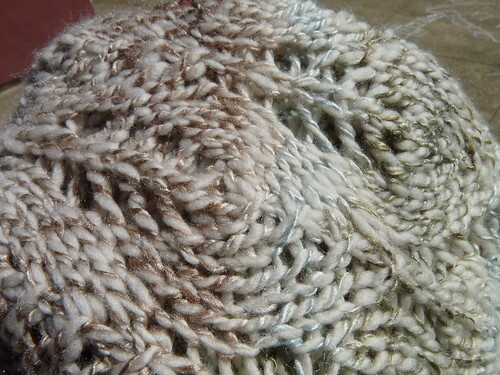 Maybe cos both times, the lamb fleeces from WFB were some sort of magic and shifted color midstaple. Miss you, only thing more than half. The goal was to make something machine washable (or, at least spot washable/easy care) that she could wear easily as quick cover for nursing baby. 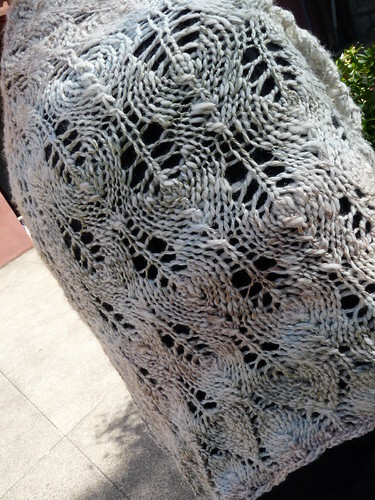 I knit it on huge huge needles (7.0mm) to really stretch out the most fabric widthwise I could when knitting, but only lightly blocked it by shaping the edges with blocking wires and lightly stretching to dry. 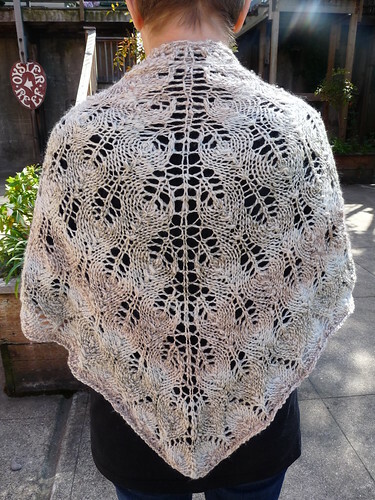 I worried a severe blocking would mar the pattern (already a bit indistinct with the huge needles)... and that my sister is smaller than me and I didn't want it to overwhelm her frame. 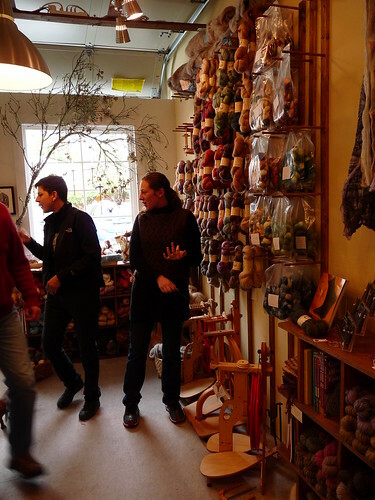 While the goal of the project was met, it was really the yarn I was excited about. 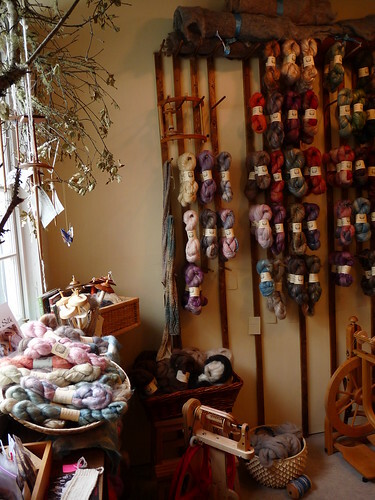 When I spun the tussah silk I knew I was aiming for long stretches of color, but really had no idea of their impact when plied with the white until I saw the striping of the Shetland Triangle appear. They look planned... and how I love when the yarn does the work for me :) I also appreciate their subtlety; my sister isn't a knitter and what speaks to me isn't necessarily what'll float her boat. 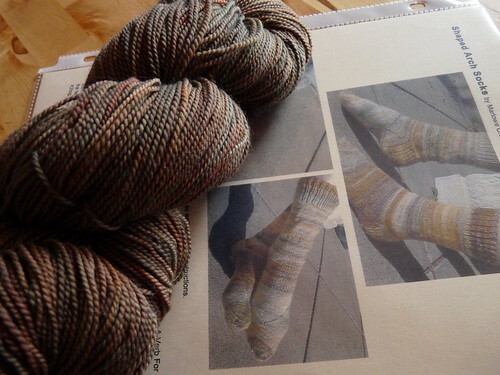 (Noro springs to mind-- I never really dug the color striping and coordination until I knit with it and saw it jump off of my own needles.) I think the white here offsets the striping impact, in that it's not the only thing you see. 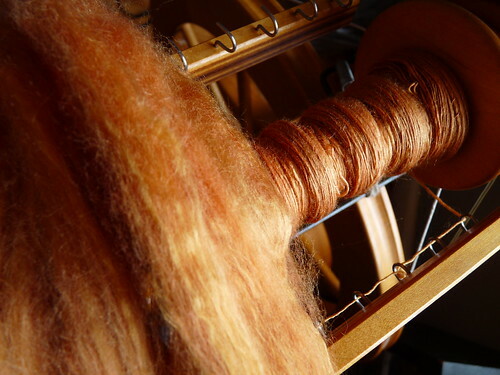 I also really dig that I did what I intended to do-- spin and ply the silk tightly with the lower twist merino/cashmere, and have the white ply sort of jump out of the silk's grip in both yarn and finished object. The result is so soft and shiny... I hope she likes it too! 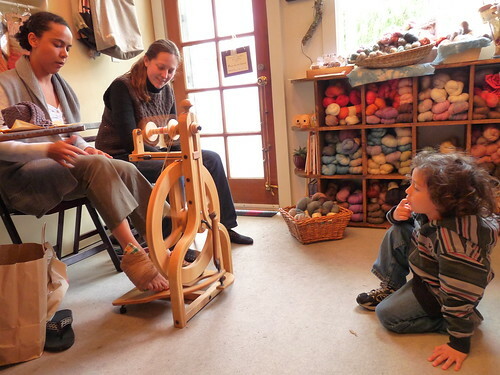 What's great is she saw me spindle spinning during my last visit and was fascinated-- I think she'll be one who appreciates the start-to-finish of this project. I couldn't resist showing it off before mailing, so when I heard that A Verb for Keeping Warm was having a celebration to welcome their new full time employee Adrienne, I packed it and the kid up and headed to the WorkShop where I got to show Kristine what her fiber grew up to be and see this ground-up retail store for the first time. Another cool thing about the WorkShop is that its creation stayed true to the business' vision: it started with a small truly empty space that was insulated with recycled denim fiber, panelled with findings, windows and doors from Urban Ore, painted with remaindered paint from SFMOMA and floored with carpet from the same. I couldn't get away from bringing some stuff home with me. It didn't help that my son was with me, he was talking me into purchases all day :) We finally agreed on two (not eight like he wanted!) 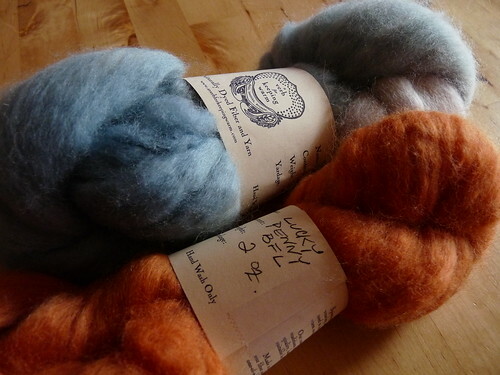 bunches of BFL for a special something for him. 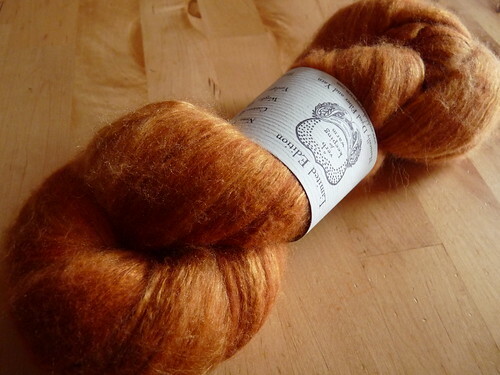 I also picked up something special for me... merino/silk in "sunny side up." 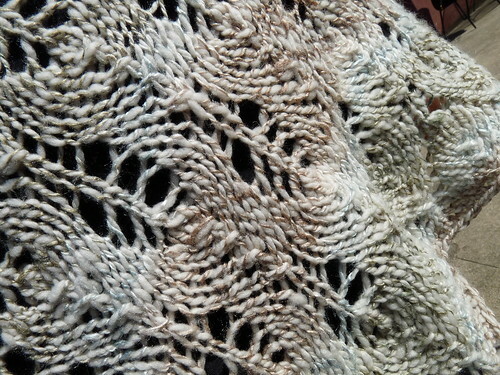 SO much prettier than my overcast photos show... and the last bit :( ...an end run of a limited colorway. Ishbel maybe? What we want and what we have... but as always, out of time. Til then.